I've come back to look at this a few times now. It is, indeed, impressive, but looks like something I'd expect to see in a library. 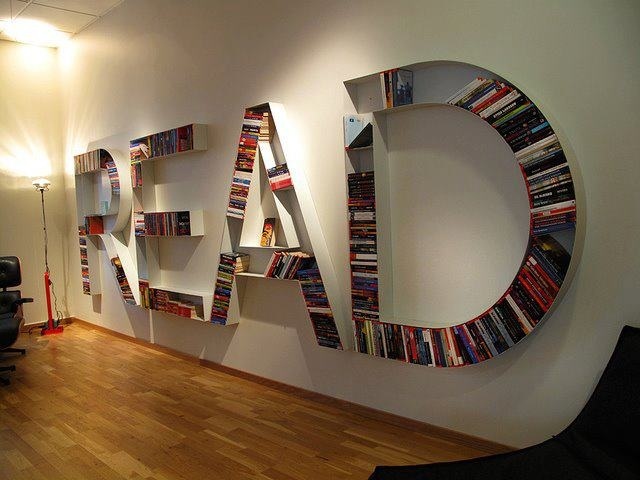 Here is a very large wall that you can't use for anything else, and it isn't even an efficient form of book storage. I realize that efficiency and decoration are rarely bedfellows, but I tend to think in terms of my own digs here. Our place is very confined (I prefer the term "cozy," but in the interest of truth...), and if I were to put up something like this, I'd have to give up half my other belongings! There speaks the voice of a practical man! I know - but I still find it unbelievably cool. We are now, as I mentioned to you on your site, somewhat confined space-wise now, and we don't have a bare wall anywhere that's anything like what would be required to have this. I was trying to figure out if it would be possible to make a small version - just for the fun of it. They'd have to be very fat letters!! Ah well, where would we be without some whimsy in the world? Ah, whimsy... Did you get back to the Hideout to read my reply? I left you a link you might enjoy. Yes I did. I just haven't written there... Been flying this last 48 hours with work stuff. But, thank you! I'll check it out from home.